Britain will table new proposals next week in an attempt to end the deadlock over the EU's 2007-13 budget, UK Foreign Secretary Jack Straw has said. He was speaking after EU foreign ministers rejected a British proposal published on Monday, which would have cut development aid to eastern Europe. Most said they wanted the UK to give up more of its cherished rebate than it has so far proposed. The UK is hoping for a budget deal at a summit on 15 and 16 December. Diplomats reported that most ministers who spoke at the meeting accused the UK of acting out of self-interest when it made its original proposal. They said it should be ready to give up more of its rebate, won by Margaret Thatcher in 1984, and now worth 5.7bn euros (£3.8bn) per year. Austrian Foreign Minister Ursula Plassnik recognised that the UK had moved on the rebate, but said the movement was so slight it took a magnifying glass to see it. Spain's deputy Foreign Minister, Alberto Navarro, said 17 states, including the 10 new members which joined the EU last year, had met on Tuesday to form a bloc opposed to the UK plan. "It is an unfair proposal because it... brings money from the poor countries and brings it to the rich ones," he said. 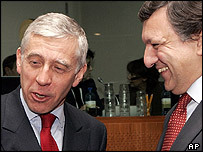 Mr Straw, however, said Britain had shown more solidarity with eastern European countries than other countries, by allowing their workers unrestricted access to the UK labour market. "This has been a major benefit to those countries," he said. The foreign ministers' meeting was the first occasion that EU member states had gathered to discuss the UK's detailed plan. The meeting marks the beginning of an intense period of negotiations leading to the 15 and 16 December summit in Brussels. French President Jacques Chirac will meet the new German Chancellor Angela Merkel on Thursday "to prepare together" for the summit, Mr Chirac's spokesman said. UK Prime Minister Tony Blair will meet five visiting EU leaders on Thursday and another three on Friday. He will speak to at least two others by telephone.